A local volunteer in South Sudan uses a flip chart to educate villagers on Guinea worm disease prevention. 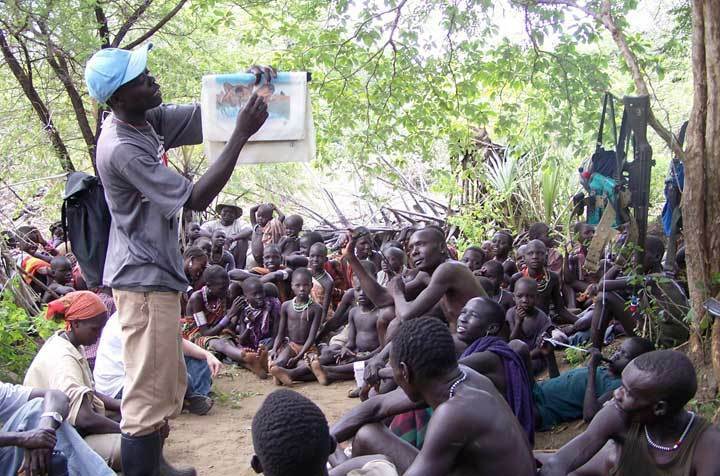 Harboring the vast majority of the world's remaining cases, South Sudan has become the last frontier on the difficult path to eradicating this debilitating parasitic disease. Credit: The Carter Center/L. Gubb, “INFORMATION SESSION,” The Global Health Chronicles, accessed April 20, 2019, https://globalhealthchronicles.org/items/show/4927.